HOUSTON — (June 28, 2018) — James McNew's and Michael Stern's biochemical hunt for the root cause of a rare, paralyzing genetic disorder is a 10-year quest that's taken an unexpected turn toward everyday killers such as Alzheimer's disease, cancer and aging. The National Institutes of Health has awarded the Rice University scientists a five-year R01 grant to investigate a biochemical domino effect that begins with a critical regulatory protein called TOR and ends with cells dying of oxidative stress. TOR regulates cell growth and survival and only recently became a focus for Stern and McNew, professors of biochemistry and cell biology in Rice's Department of BioSciences and co-investigators on the $1.9 million grant from the NIH's National Institute of Neurological Disorders and Stroke. "It's known that TOR controls starvation in virtually every animal, including humans," McNew said. "Decreased TOR activity has even been found to increase the life span of yeast, worms and fruit flies, and some studies have found that TOR-inhibiting drugs increase the life span of mice. Increased TOR activity is also involved in cancer and has been implicated in Alzheimer's, Parkinson's and other neurodegenerative diseases, including one called hereditary spastic paraplegia (HSP) that we have studied for many years." HSP, a rare disorder that affects about 20,000 people in the U.S., is marked by numbness and weakness in the legs and feet due to progressive deterioration of the longest cells in the body — the neurons that connect the spine to the lower legs. In 2016 Stern, McNew and colleagues used hundreds of experiments on dozens of mutant strains of fruit flies to show how an HSP gene produced defective synapses at the junctions between nerve and muscle cells. In follow-up work last year, McNew, Stern and postdoctoral researcher Shiyu Xu conducted more experiments to see exactly how these synapse defects caused neurons to malfunction and die. "Shiyu wasn't able to find any evidence of neurodegeneration, but he did find evidence of muscle degeneration," Stern said. "That was a surprise, and we didn't know what to make of it at first. Even though nerve damage is a known cause of muscle atrophy, conventional wisdom is that the nerve cells die first." Intrigued, the group conducted experiments to see what was happening at the molecular level. 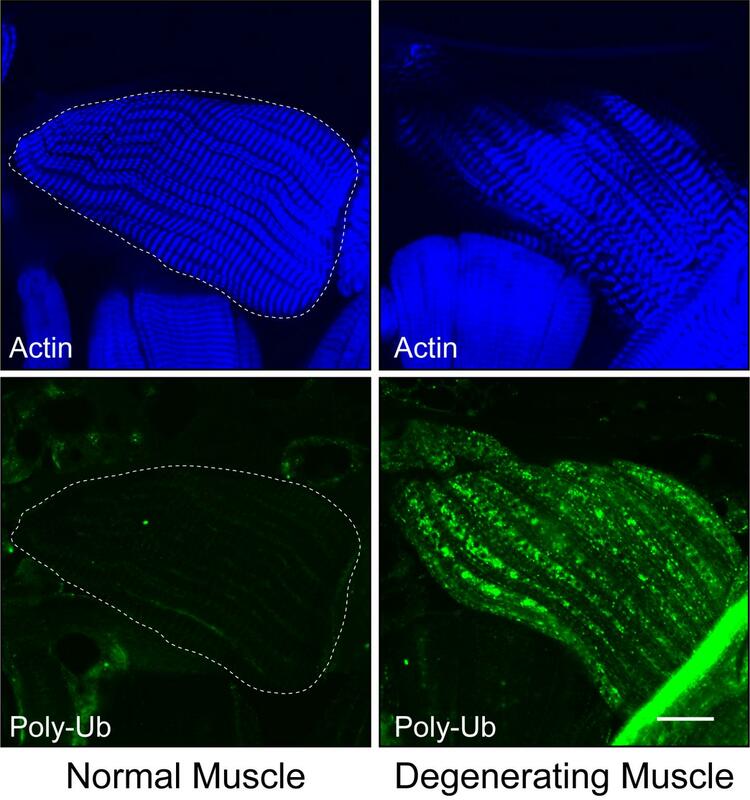 Tests suggested elevated TOR activity in the degenerating muscle cells. TOR is short for "target of rapamycin"; when TOR was discovered in the early 1990s, researchers only knew it was the target of a natural compound called rapamycin, an immunosuppressant that had been widely prescribed for decades to transplant recipients. "We were convinced it was TOR after Shiyu showed he could slow down the muscle degeneration by giving the flies rapamycin," Stern said. TOR is an important master regulator of growth and nutrient-sensing. When fully activated, TOR promotes growth so aggressively that cells forgo daily chores such as repairing structural damage and recycling partially functional organelles. In times of extreme stress or starvation, TOR is fully deactivated so the cell can enter a survival mode and conserve scarce resources. "TOR isn't an on-off switch as much as a knob for dialing growth up or down," McNew said. "It's not that high TOR is bad and low TOR is good. Each is needed under certain conditions, and TOR's function — which is essential in all higher-order life, from yeast to humans — is to modulate growth to match the conditions it's detecting." Stern said, "What appears to be happening in the muscle cells that aren't receiving neuronal signals is that the knob gets switched onto high and stays there. TOR locks the cells into this aggressive, pro-growth mode and they stop cleaning up all of the reactive oxygen species, or free radicals, which gradually build up and cause such high levels of stress that the cell dies." Stern said this hypothesis jibes with observations from numerous other studies that have found high TOR levels and high levels of oxidative stress in the brain cells of patients with Alzheimer's as well as the atrophied muscles of patients who are paralyzed or bedridden. "In muscle atrophy studies in mice, where the motor neuron is cut, they've found that TOR is activated," he said. "This might be mechanistically similar to our case or to what's been seen in Alzheimer's because people have also found activation of the stress pathway that's induced by reactive oxygen species." Stern said previous studies also have identified some of the molecular players involved in the degeneration domino effect — including two proteins known as the JNK kinase and the FOXO transcription factor — but he and McNew are the first to connect the dots between TOR and the stress-pathway proteins. "We also see FOXO activation in our degeneration model, but we know — or at least we think we know — what is activating FOXO," Stern said. "We hypothesize that TOR causes a buildup of reactive oxygen species that in turn activates a molecule called JNK, which activates FOXO." McNew said focusing on the damage from overactive TOR means that any clues he and Stern find could potentially apply to any disease or condition in which TOR activation is implicated. "The things that cause TOR to get turned on in a neuron are probably very different than those that turn it on in a liver cell or a white blood cell," he said. "We're focused on the downstream part because once you get TOR turned on, we think it does a handful of things we understand and can directly test. And those are likely to be uniform across different cell types and different conditions. That means anything we find could inform not only HSP pathology but also cancer and neurodegenerative diseases like Alzheimer's and Parkinson's."